Here it is, a glorious three day weekend and I was supposed to get a lot done on the van. Nope. 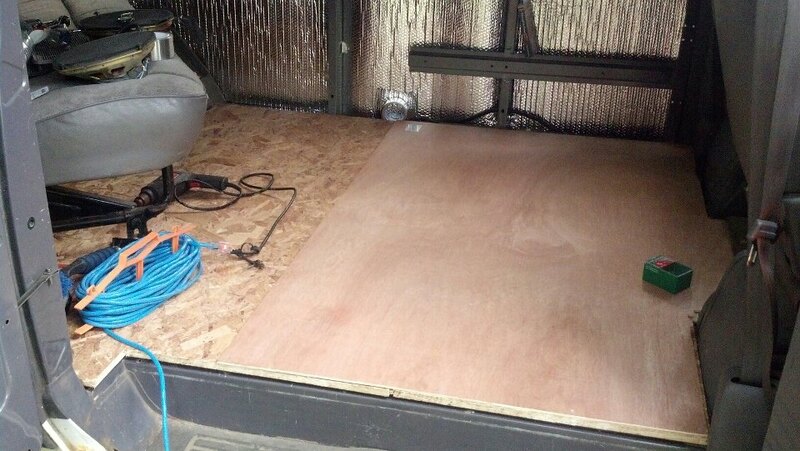 Yesterday afternoon I had just started working on the van and got my first piece of underlayment down and then I twisted my ankle jumping out the side door. Bad. Now it's swollen up and it's impossible to put any weight on it. So much for getting any work done. I had also planned to take the two old seats out of the van so I could take some pictures of what I've been doing on the inside without things cluttering up the space. Didn't get that far. I only managed to take one picture right before I twisted my ankle. Here you can see the Dricore (OSB with plastic underside) as well as the first sheet of the underlayment I'm going to be putting on top of the Dricore. I also put some Reflectix on the far wall yesterday morning when I had a few minutes to spare. Just wanted to see how much of a difference it'd make. Still planning to add some type of other insulation also.